During this enrichments, I made two project, lift and press, and all explanation about those are at the embedded image. One obstacle I successfully overcame was that I was first time that I took class about engineering, and this was almost first time that I decide what to make. When I was making lift, I made many mistakes, and there was many problems with final product. However, when I was making the press, even though it was at least better, and now I feel I improved a lot with engineering during the enrichment. If I take this class again, one thing I want to do differently is to research more. For this time, I focused on making, based on my ideas, and led to many problems. Then, I think I will be able to reduce number of mistakes/problems by researching and finding out how other people made the thing that I am making. Also, it will be much easier with research. One mistake I learned from this trimester was that too much is worse than little less. For lift, I didn’t want pins coming out, so I cut pins into really long pieces, and I thought it will be better if I use more, but too much just led to problems. For press, I want to make body stronger by using many duct tape, and it also led problems such as hard to refill water, and hard to fix it when there is a problem that I want to fix. This was first time that I decided to take engineering class, and through the enrichment, I made mistakes, and learned a lot. 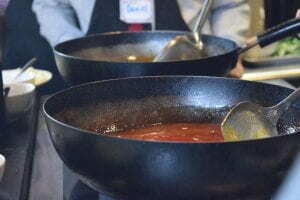 The reason that I decided to choose was to learn cooking , and why I didn’t choose top chef was just because I thought top chef would be too popular, and also I wanted to learn about Chinese dishes. 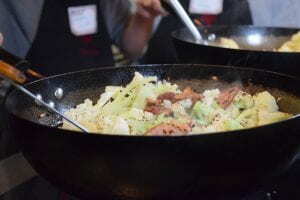 Our class decided to learn about Sichuan Menu B, which includes foods below, and we also had a tea ceremony, and students made their own tea packaging. It took about 1 hour to get there, and after we arrived, a Teacher named Michelle helped us learning cooking. There was some apple, and something similar to JianBing was on the table, and we could eat them. 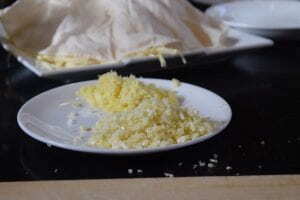 We first tasted many spices such as light soy sauce, white pepper, and Sichuan pepper. 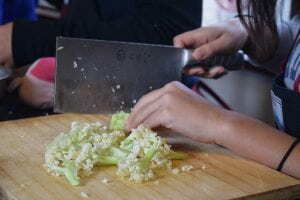 The teacher said that we have to understand about spices and ingredients in order to use them well.
. We prepared ingredients in order of cucumber, cabbage, cauliflower, chicken, and peanut. After we prepared ingredients, we started making Sichuan Simmered Beef (水煮牛肉). It was cooked beef with spicy soup; we made one more spicy than the other. Then, we cooked Stir Fried Cauliflower with Black Beans and Cured Bacon （豆豉菜花). Sichuan Noodle salad with shredded chicken(四川鸡丝凉面）was already cooked. After we cooked every dishes, we started eating them. Stir Fired Cauliflower was most popular, and Simmered beef was least popular. My favorite was noodles; it was bit spicy, and it was very delicious. At last, teacher gave us the printed recipe of those dishes. After finishing eating, we started making our own tea packaging. We mixed various types of tea ingredients. We put some sticker on a bag, and we drew picture on front side, and wrote ingredients on back side. 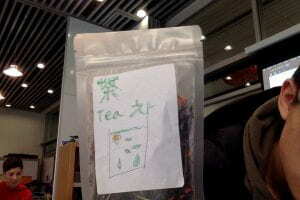 For front side, I wrote tea in three language (Ancient Chinese, English, and Korean) with drawing of tea. Because of lack of time, we could’t try some tea. Overall, it was very good experience. I could learn cooking Chinese dishes, and learn more about Chinese spices. Even though I feel it was bit expensive, it was great experience. These are top 5 diseases that cause death. Especially, I researched about the Cancer and I shared with other students about other diseases. I noticed that there are common foods that we should avoid or eat. These (chart below) are foods that we should avoid or eat to prevent and recover top 5 diseases that cause death. As I said before, I researched for cancer, and In common, we should avoid bad fat, smoking, oily foods, too much sugar, and salty food, and we should eat good oil, fruits, vegetable, whole food, and water. I brought some cereals and mandarins. I brought these because most of cereals have lots of sugar, and I found cereals that have less sugar, so I thought that sugarless cereals can be health, and I brought them. Also, I brought mandarins because they have vitamin C. Unfortunately, I didn’t have computer or something that I can take picture with, so I don’t have any pictures. I am from “Big Bird”. This book is about many stories about me using “Story Birds”. I hope you enjoy my story.